The United States is competing with four Western countries for three seats on the Human Rights Council in the only contested election at the U.N.’s top human rights body. The 193-member General Assembly is scheduled to vote Monday for 18 members of the 47-member council. African, Asian, Eastern European and Latin American countries have put forward uncontested slates whose candidates are virtually certain of victory. Several human rights groups have criticized a number of these candidates as unqualified including Ivory Coast, Ethiopia, Gabon, Kazakhstan, Pakistan and Venezuela. The five Western nations competing for seats — the U.S., Germany, Greece, Ireland and Sweden — were all deemed qualified by the rights groups. He said at the group’s annual luncheon at U.N. headquarters ahead of the vote, on Friday, that the United States was the last of the five candidates to enter the race and found that many countries had already made commitments to the other candidates. Philippe Bolopion, United Nations director for Human Rights Watch, said that to its credit, the Western group is the only regional group allowing true competition in Monday’s election. “As a result, and despite its highly effective engagement in the Human Rights Council, the U.S. faces a tough yet healthy competition,” he said. Bolopion said it was sad that the Africa, Asian, Eastern European and Latin American groups at the U.N. “have pre-cooked this election by offering as many candidates as they have been allotted seats.” He said this is “making a mockery” of the standard set by the General Assembly that all candidates for the council “uphold the highest standards” of human rights. The Human Rights Council was created in March 2006 to replace the U.N.’s widely discredited and highly politicized Human Rights Commission. But the council has also been widely criticized for failing to change many of the commission’s practices, including putting much more emphasis on Israel than on any other country and electing candidates accused of serious human rights violations. Former President George W. Bush’s administration boycotted the council when it was established over its repeated criticism of Israel and its refusal to cite flagrant rights abuses in Sudan and elsewhere. But in 2009, then newly elected President Barack Obama sought to join the council saying the U.S. wanted to help make it more effective. In that contest, the U.S. was elected on an uncontested slate winning 167 votes, far more than the 97 vote majority needed. Amnesty has written letters to all candidates urging them to demonstrate their commitment to human rights, he said. The African candidates are Ivory Coast, Ethiopia, Gabon, Kenya and Sierra Leone. The Asian Group candidates are Japan, Kazakhstan, Pakistan, South Korea and the United Arab Emirates. The Eastern European Group candidates are Estonia and Montenegro, and the Latin American and Caribbean Group candidates are Argentina, Brazil and Venezuela. The current Ethiopian constitution provides for freedom of religion and requires the separation of state and religion. However the Muslim community in Ethiopia has been, for more than a year now, holding protests at mosques around the country against what is perceived as government interference in religious affairs. The protesters are demanding that the current members of the Islamic Affairs Supreme Council (Majlis) be replaced by elected representatives and that elections for Majlis representatives be held in mosques rather than in the Kebeles. Some members of the Muslim community accuse the Ethiopian Government of controlling the Majlis and sponsoring the propagation of Al-Ahbash, a little known sect of Islam. The Ethiopian Government, on the other hand, accuses the protesters of being led by extremists who want to establish an Islamic state in place of the current secular multination federation. The Ethiopian Government has responded against some protests in 2012 with deadly force, most recently in Assassa in April and Gerba in October, resulting in the death of at least seven protesters, a large number of injuries, and the imprisonment of a number of protesters on terrorism charges. The protests were triggered by the suspension of the Awoliyah Muslim Mission School and the dismissal of 50 Arabic teachers via a letter issued by the Majlis. The Awoliyah Muslim Mission School, has been a member since 1993 of the Islamic charitable agency known as International Islamic Relief Organization (IIRO), and has been linked to the Saudi Arabia controlled World Muslim League. Ethiopian authorities consider Awoliyah to be a breeding ground for a new generation of radical Muslims, which they refer to as “Salafi-Jihadists” or “Wahabi-Salafists”. However, the Muslim protesters have consistently adhered to nonviolent demonstrations, leaving the Ethiopian Government with little to no evidence of behavior or action that could be described as terrorism. It is clear to date that the Ethiopian Government is manufacturing a security problem where none actually exists. A careful consideration of the matter reveals that what’s happening in Ethiopia today is a reflection of what has been taking place in the West. Concerns about terrorism have degenerated into an irrational suspicion of Muslims, which will continue unabated until Ethiopia and its Western partners reflect more critically on their own perceptions. It is reasonable to argue that Ethiopia’s leaders are experiencing a growing fear of Islamic terrorism given the fact that it is combating the Al-Qaeda-linked Al-Shabab in Somalia and the Ogaden National Liberation Front (ONLF) in the Somali region of Ethiopia. This is buttressed by a universal consensus among analysts that Somalia and Sudan are exporters of both political Islam and Islamic terrorism. 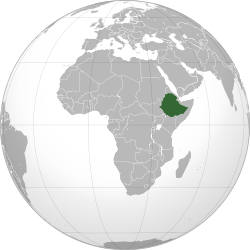 Given that Ethiopia is widely considered as a bulwark against Al Qaeda-linked terrorists in the Horn of Africa, Somalia and, across the Gulf of Aden, in Yeman, one could argue that Ethiopia is not suffering from siege mentality, but rather that it is suffering from rational fear. There is some evidence that the Ethiopian Muslim community has been radicalized, although not in the sense that it has a political agenda, but in the sense that it has attained a higher degree of religious consciousness and has become more aware of its particularistic identity. In light of “Arab Spring” events that took place in North Africa and the Middle East, toppling repressive governments, it can be argued that the Ethiopian authorities are haunted by the fear of an ‘Ethiopian Spring’, which has not only contributed to the current crackdown on the media and the political opposition, but also against the Muslim community. Ethiopia has increasingly become intolerant of Islam. There is little evidence to support the Ethiopian Government’s claim that its own Muslim community poses a legitimate threat to national and regional security. It only seems to be driven by a shrewd strategic calculus. Since Ethiopia is a critical partner in the West’s war on terror, the government thinks it helps to foment fear of the rise of radical Islam in Ethiopia that would lead to an improbable takeover of power by political Islam. The current Ethiopian Government seeks to keep Western support and aid flowing into the country through characterizing the Muslim community as linked to Islamic radicals and terrorist and thus a threat to national security. The fear being cultivated by the Ethiopian Government without basis in evidence has lead to the dubious actions it has engaged in. It would be irrational for a country that has had a history of Islamic terrorism to dismiss the fear of Islamic terrorism. When it comes to Ethiopia, the fear is irrational in light of its recent past and current events. My point is that rational fear can be a guide to sensible public policy. However, it is simply absurd to believe that all Muslims in Ethiopia are fiends and terrorists in disguise. The Ethiopian Government is using irrational fear to justify intolerance of Islam, and all of this because of bad public policy. To the extent that secularism is a constitutionally enshrined principle of governance, the interference is unacceptable. Any sponsorship by the government of a religious sect over others or any attempt of privileging one religion over another is illegitimate, be it Al-Ahbash or Wahabi. But this is not to divest the government of its legitimate authority to neutralize security threats as they arise. Recognizing the threshold requires not only good public policy and laws, but also responsible enforcement. If the Ethiopian Government supports a religious group such as Al-Ahbash, it must leave the task of propagating it to the faith-based nongovernmental organizations, rather than the Ministry of Federal Affairs. The primary problem is that the Ethiopian Government has already legislated civil society out of existence with its charities legislation, so that the legitimate activities of religious groups are constrained. The threat claimed by the Ethiopian Government, which as yet is not clear and present, does not emanate from radicalization, but from the embrace of political Islam and its concomitant militancy. The threat emanating from radicalization in my view does not call for direct government intervention. It would have been better addressed by civil society organizations. Unfortunately, in Ethiopia today there is barely any vibrant civil society, including religion-based and inter-faith NGOs working in the area of peace and reconciliation as they were legislated out of existence by the government itself. My prognosis is that the protests will surely grow so much so that it overwhelms the government’s ability to handle the situation. I don’t expect the peaceful Muslim protesters to resort to violent means in the near future. My concern is that the Ethiopian government will eventually resort to more force and repression than is warranted under the circumstances. While it is impossible to predict the consequences, one thing is certain – hatred begets hatred. Some thought the protests would simply go away with the Majlis elections. Now we know that a significant proportion of the Muslim community boycotted the polls that took place on 7 October 2012, although the Government claimed the elections were concluded successfully. Another reason why the Ethiopian Government’s actions are misguided is because Islam has been historically a decentralized religious institution in Ethiopia. With the formal establishment of the Majlis by the Ethiopian Government in 1976, it has enjoyed an official governmental status, with its chairman considered by the government as “representative of the entire Muslim community,” and is accorded the same courtesies as the Patriarch of the Orthodox Church, the Bishop of the Catholic Church, and the Head of the Protestant Churches in public ceremonies. Historically, it has always been the responsibility of local mosques to appoint clerics, which makes the Ethiopian Government’s effort to control each and every mosque in the country through the Majlis untenable. It simply doesn’t work that way. If the Ethiopian Government wants to help resolve this emerging conflict, it should refrain from interference. It should also make a goodwill gesture not only towards meeting the demands of Muslim protesters, but also in promoting a respectful and sustained dialogue among Muslims belonging to different Islamic sects, instead of promoting one sect of Islam to the exclusion of others. A positive first step would be to release the imprisoned elected leaders of the Muslim community and conduct the election of the members of the Majlis at the mosques rather than at the kebeles. Moreover, it must stop sponsoring Ahbashism at the expense of other sects of Islam as long as they respect the constitution and other laws of the land. Last but not least, the Ethiopian Government should refrain from unnecessary provocations, which have been abundant in government publications and statements by authorities. After all, the Ethiopian Government owes Ethiopian Muslims all due respect and treatment, if not tolerance. For me, tolerance is not enough. The problem with applying the concept of tolerance to the case of Ethiopian Muslims is that it neglects the rich history of Islam in Ethiopia. It ignores the fact that Ethiopia’s Muslims were early historical converts in the same way as Ethiopia’s Christians. However, through repressive interference the Ethiopian Government will only be sowing the seeds of a radicalized political Islam that it seeks to keep at bay. The ongoing interference will do more harm than good. The Ethiopian authorities are committing human rights violations in response to the ongoing Muslim protest movement in the country. The Ethiopian authorities are committing human rights violations in response to the ongoing Muslim protest movement in the country. Large numbers of protestors have been arrested, many of whom remain in detention. There are also numerous reports of police using excessive force against peaceful demonstrators. Key figures within the movement have been charged with terrorism offences. Most of those arrested and charged appear to have been targeted solely because of their participation in a peaceful protest movement. Tens of thousands of Muslims have participated in regular peaceful protests throughout 2012, opposing alleged government interference in Islamic affairs. Protestors accuse the government of attempting to impose the teachings of the Al Ahbash sect of Islam on the Muslim community and of interference in elections for the Supreme Council of Islamic Affairs. Ethiopia’s Constitution prohibits state involvement in religious affairs. The Constitution also contains an expansive provision on the right to peacefully protest, which is routinely flouted by the authorities. An incident that occurred in Gerba town, in the South Wollo zone of the Amhara region, on Sunday 21 October -during which police officers fired on civilians, killing at least three people and injuring others - raises serious questions about the use of deadly force against protestors. In speaking about the incident to the media, the government confirmed the three deaths but claimed that protestors had attacked a police station armed with machetes and hand guns to try to secure the release of another protestor who had been arrested earlier in the day. The government also stated that a police officer was killed in the alleged attack. However, the protestors report that they had peacefully demanded and secured the release of the arrested person during the morning of 21 October and the protest had subsequently dispersed. Later in the day federal police, called in as reinforcements, arrived at the mosque in Gerba town and opened fire, targeting people coming out of the mosque as well as others in the vicinity. One man told Amnesty International that he had seen a police officer killed in the ensuing violence. Other witnesses said they could not confirm any police deaths. An unknown number of arrests are reported to have taken place during the incident on 21 October and more arrests reportedly occurred in the aftermath of the incident, including the arrests of people who spoke to the media about events. Amnesty International has previously reported on similar, incidents of police allegedly using excessive force. In July Amnesty International called for an investigation into two incidents – at Awalia and Anwar mosques in Addis Ababa – in relation to which numerous allegations were made about excessive use of force by police, including firing live ammunition and beating protestors in the street and in detention, resulting in many injuries among protestors. However, no investigation has taken place to Amnesty International’s knowledge. Amnesty International is also calling for an independent investigation into an incident that took place in Asasa town, Arsi district, Oromia region in April in which the police reportedly shot dead at least four people. Reports about the incident from the government and from those involved differ widely. The violence is reported to have occurred when the police attempted to arrest an Imam from the mosque. In statements to the press after the event, the government stated that supporters of the Imam attacked the police station to try to secure his release. However, local sources told the media that the police had opened fire in the town when supporters tried to prevent the man’s arrest. The government claimed the Imam had been preaching extremist ideology. However the protestors claim that the attempted arrest was because the Imam had refused to undergo ‘training’ in Al Ahbash ideology, which the government had made obligatory for Muslim preachers. On 29 October, 28 men and one woman were formally charged with ‘terrorist acts’ and ‘planning…, incitement and attempt of terrorist acts’ under the Anti-Terrorism Proclamation (2009) in relation to their involvement in the protest movement. Two Muslim organisations were also charged under the same law with ‘rendering support to terrorism.’ Those charged include nine members of the committee selected by the Muslim community to represent their grievances to the government, and one journalist, Yusuf Getachew, who works for the publication Ye’Muslimoch Guday (Muslim Affairs). These individuals appear to have been arrested and charged solely because they exercised their human rights to freedom of expression and to participate in a peaceful protest movement. Since its introduction in 2009 the excessively broad Anti-Terrorism Proclamation has predominantly been used to prosecute dissenters and critics of the government, including journalists and members of political opposition parties. At least 24 of those charged on 29 October were arrested in mid-July and have been held on remand under the Anti-Terrorism Proclamation, which allows for up to four months of investigative detention without charge. The defendants were detained illegally for the last five days before the charges were brought, after the police and prosecutors failed to turn up to a hearing on 24 October at which they were required to present charges and evidence, causing the judge to declare the case closed, according to one of the lawyers for the defendants. However, the judge did not order the release of the group, who were then brought to court on 29 October and charged. A senior representative of the government told Amnesty International that the arrested individuals instigated violence and were trying to undermine the Constitution under the guise of religion. Similar statements from other senior members of the government have also been reported in the media. Amnesty International is concerned that, in a country where the government has significant influence over the courts, these comments may undermine the right of the accused to presumption of innocence. The government has repeatedly attempted to paint the protest movement as violent and terrorist-related in statements to the media and in parliament. However, the vast majority of the protests are reported to be peaceful, and peaceful tactics have repeatedly been used by the protestors, including silent demonstrations and holding up white material, paper and ribbons as a sign of peaceful intent. While a few isolated incidents of violence have occurred, these have taken place during episodes where excessive police force is alleged. According to the accounts of the protestors, it was the actions of the police that triggered a violent response. Independent investigations are required to establish the course of events during these incidents. Since July, when large numbers of arrests took place and incidents occurred at Awalia and Anwar mosques in Addis Ababa, protests have continued to take place in several regions, including in the towns of Dessie, Jimma, Harar, Shashemene, Adama, Bati, Kemise, and Robe. In addition to the original grievances of the movement, the protestors also demonstrated against the continued detention of members of the committee chosen to represent the Muslim community’s grievances to the government. Arrests, arbitrary detention and harassment of protestors are reported to have taken place in a number of locations.? Many of these reports have included allegations of police beating protestors, and the use of tear gas against peaceful demonstrations has been alleged in at least two locations. Many demonstrations occurred in advance of elections for the Supreme Council of Islamic Affairs, which took place on 7 October. Although the long delay in holding the elections was one of the central grievances of the movement, the protestors raised several serious concerns in relation to the elections, including: the fact that the elections took place while their chosen representatives remained in detention; the level of control the government had over the poll; and the rejection of the protestors’ long-standing demand that the elections should be held in mosques instead of in kebele (local administration) offices. Demonstrators also allege that the government was coercing voters in advance of the election, threatening the withdrawal of access to state resources and other repercussions for those who did not vote. In statements made to Amnesty International and to the media, members of the protest movement have reported that a significant proportion of the Muslim community boycotted the poll, although the government declared the elections a success. It is not known how many protestors are now in detention. Hundreds of arrests have been made over recent months. Of the large numbers who were arrested around the two July incidents, as reported by Amnesty International on 25 July, many were detained for a few days and subsequently released. However, an unknown number remain in detention, in Maikelawi, Ziway and other detention centres. The government has sought to prevent reporting on the protest movement. Two colleagues of Yusuf Getachew from Ye’Muslimoch Guday fled the country after Yusuf was arrested and their own houses were searched. Neither Ye’Muslimoch Guday nor two other Muslim publications - weeklies Selefiah and Sewtul Islam - have been published since the July events. A correspondent for Voice of America was temporarily detained on 5 October in Addis Ababa while reporting on protests against the Supreme Council elections, and was told to delete any interviews she had recorded with protestors. The response of the Ethiopian government to the protest movement has involved widespread violations of human rights. There has been almost no effort on the part of the authorities to engage with the protestors on their grievances or to put in place mechanisms for dialogue. Amnesty International believes that the majority, if not all of those arrested, have been detained for exercising their right to peaceful protest, as protected under the Ethiopian Constitution and international law. The organization is calling on the Ethiopian authorities to release immediately and unconditionally any individuals who have been detained for their participation in protest actions. All detainees who remain in detention without charge must be brought swiftly before a judicial authority. Where credible evidence of a criminal offence exists people must be charged promptly, or should be immediately and unconditionally released. All detainees must have their rights in detention upheld, be provided with full access to legal representatives, medical care if they require it and to family members. The reports of police use of excessive force against protestors in Gerba on 21 October, in Addis Ababa in July and in Asasa in April, must be properly investigated through processes that meet international standards in relation to impartiality and credibility. If enough admissible evidence of crimes is found, suspected perpetrators should be prosecuted in effective trial proceedings that meet international standards.
? These incidents have been reported in local and Diaspora media, on social media sites, and in information submitted directly to Amnesty International.